River Ridge Golf Club, Victoria Lakes Hole 3: This par four plays along the edge of the hill and requires a drive that stays on the right side of the fairway as it slopes strongly towards the left and the out of bounds. The green is tricky as it runs away and has a depression in the back left. 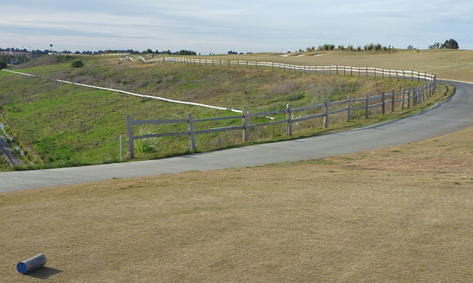 River Ridge Golf Club, Victoria Lakes Hole 4: This is the typical par five with two lakes. The prominent one on the drive is to the left although a big drive right can find the other. The second shot then must consider the lake on the right, although it stops before the green complex, encouraging the long hitter to go for it. 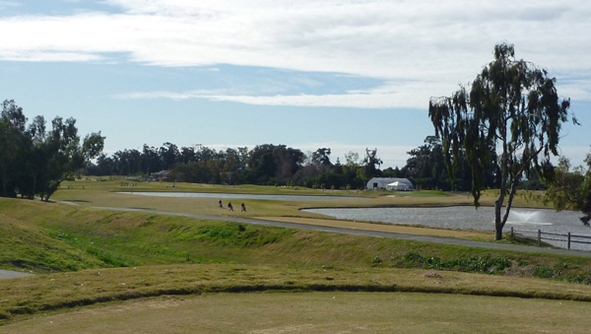 River Ridge Golf Club, Victoria Lakes Hole 6: Not the longest par four on the course, but a tricky one, the sixth has a wide landing area except for the aggressive drive that goes long and too far right, which can find the water through the fairway. The second shot is to a wide green with a small fronting bunker dead center. The real trouble is the lake short of that that wraps around the right side of the green. River Ridge Golf Club, Victoria Lakes Hole 7: This par three is not particularly difficult with the green being large and the lake being about 20 yards short of the putting surface. River Ridge Golf Club, Victoria Lakes Hole 10: The first hole on the back nine is all about the lake to the left of the green. Any pin placement to the left half of the green is tough to get close to without breaking a sweat. The best drive will hug the bunkers on the right side of the fairway, but should definitely avoid them and the steep hills around them. River Ridge Golf Club, Victoria Lakes Hole 12: This brutal par five features OB down the left but that is not the real concern. The large lake to the right can come into play on all three shots. The green is shallow and wide and located behind that lake. Thus, any shot to that green must be high and accurate to avoid a big score. River Ridge Golf Club, Victoria Lakes Hole 13: Similar to the 4th hole, but in reverse and a difficult par four instead, this hole requires the golfer to avoid the lakes, which are in play on both shots. Usually into the prevailing wind, this hole plays very long. 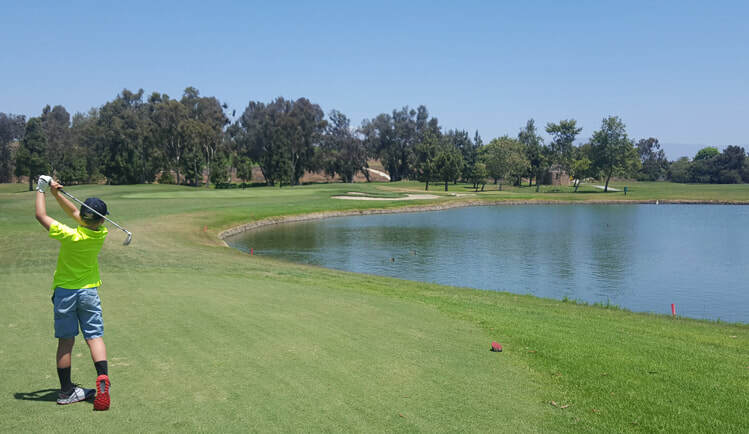 River Ridge Golf Club, Victoria Lakes Hole 16: This par four has a fairway that sweeps from left to right and a green than runs away from the approach shot. Back pins are really tough as going long will send the ball down a hill and leave a really tough up and down, but leaving the approach short will leave a fast downhill putt. 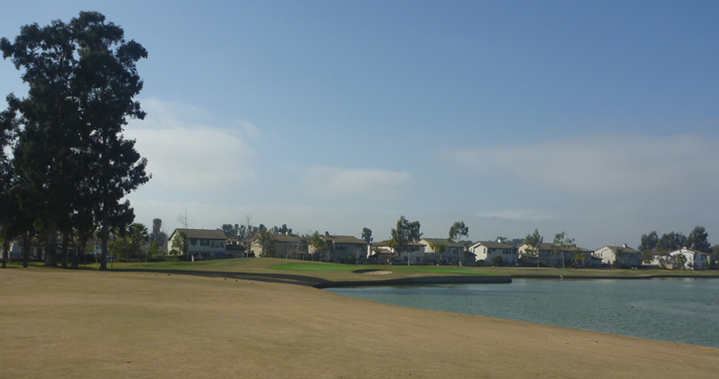 River Ridge Golf Club, Victoria Lakes Hole 17: On a clear day, the views of Ventura and Oxnard from the tee box are great. The golf hole itself is a long par three over a large grass gully to a very steep green on the far side. Staying below the hole is a must.